Malignant pleural mesothelioma (MPM) is a tumour arising from pleural cavities with poor prognosis. Multimodality treatment with pemetrexed combined with cisplatin shows unsatisfying response-rates of 40%. The reasons for the rather poor efficacy of chemotherapeutic treatment are largely unknown. However, it is conceivable that DNA repair mechanisms lead to an impaired therapy response. We hypothesize a major role of homologous recombination (HR) for genome stability and survival of this tumour. Therefore, we analysed genes compiled under the term “BRCAness”. An inhibition of this pathway with olaparib might abrogate this effect and induce apoptosis. We investigated the response of three MPM cell lines and lung fibroblasts serving as a control to treatment with pemetrexed, cisplatin and olaparib. Furthermore, we aimed to find possible correlations between response and gene expression patterns associated with BRCAness phenotype. Therefore, 91 clinical MPM samples were digitally screened for gene expression patterns of HR members. A BRCAness-dependent increase of apoptosis and senescence during olaparib-based treatment of BRCA-associated-protein 1 (BAP1)-mutated cell lines was observed. The gene expression pattern identified could be found in approx. 10% of patient samples. Against this background, patients could be grouped according to their defects in the HR system. Gene expression levels of Aurora Kinase A (AURKA), RAD50 as well as DNA damage-binding protein 2 (DDB2) could be identified as prognostic markers in MPM. Defects in HR compiled under the term BRCAness are a common event in MPM. The present data can lead to a better understanding of the underlaying cellular mechanisms and leave the door wide open for new therapeutic approaches for this severe disease with infaust prognosis. Response to Poly (ADP-ribose)-Polymerase (PARP)-Inhibition could be demonstrated in the BAP1-mutated NCI-H2452 cells, especially when combined with cisplatin. Thus, this combination therapy might be effective for up to 2/3 of patients, promising to enhance patients’ clinical management and outcome. Malignant pleural mesothelioma (MPM) is a highly aggressive tumour arising from the pleural cavities [1, 2]. Despite treatment, MPM patients have poor prognosis with a median survival of approximately 12 months [3–5]. The state-of-the-art systemic treatment of unresectable and advanced MPM is chemotherapy with a combination of cisplatin and pemetrexed [6, 7]. However, even with aggressive treatment approaches, recurrence or progression occurs in most cases as a result of chemotherapy resistance [6, 8, 9]. The term “BRCAness” is defined as a defect in double-strand break repair (DSBR) of DNA by the homologous recombination repair (HRR) pathway [2, 10]. HRR is involved in the repair of DNA lesions blocking the replication fork or inducing double-strand breaks (DSBs) . Alterations in various genes, associated to BRCAness phenotype, were assessed in several tumours. Interestingly, BAP1 loss-of-function mutation has been found in 26–64% of MPMs . BRCAness leads to genomic instability and therefore could make the tumour more susceptible to different chemotherapeutics targeting these features [12, 13]. Furthermore, alternative repair mechanisms could overcome the lack of HRR and tumour cells could evade apoptosis. Poly (ADP-ribose)-Polymerase (PARP) is essential for base excision repair (BER) and non-homologous end joining (NHEJ) and may be a target to inhibit alternative repair mechanisms in case of BRCAness  (Fig. 1). PARP-inhibitors are already FDA approved drugs for treatment of several cancers with Breast Cancer 1 (BRCA1) or BRCA2 mutations . We hypothesize, that not BRCA1/2 mutations are exclusively necessary for efficient PARP-inhibition therapy. We hypothesize, that PARP-inhibitors might also be effective in cancers with alterations in related genes of the whole homologous recombination repair pathway. In addition, a combination of platinum-based chemotherapy with PARP-inhibitors is assumed to be more effective than PARP-inhibitors alone . Find predictive gene expression patterns to olaparib treatment, based on HRR key players. Analyse different human MPM cell lines for the presence of defects in HRR pathway. Furthermore, we investigated if MPM cell lines shows sensitivity against PARP-inhibition. In this case, we also aimed to find gene expression patterns predictive for treatment with PARP-inhibitors. Define patients with altered HRR based on the results of the MPM cell lines analysed in 1) and validate the potential predictive gene expression pattern associated with response to PARP-inhibitors in clinical specimens. Investigate associations between patients’ survival prognosis and response to cisplatin, respectively, in association with HRR key players. Based on this study, a preselection of patients with a beneficial response to olaparib treatment might be done. We investigated the response of MPM cell lines and lung fibroblasts to treatment with pemetrexed, cisplatin and olaparib. 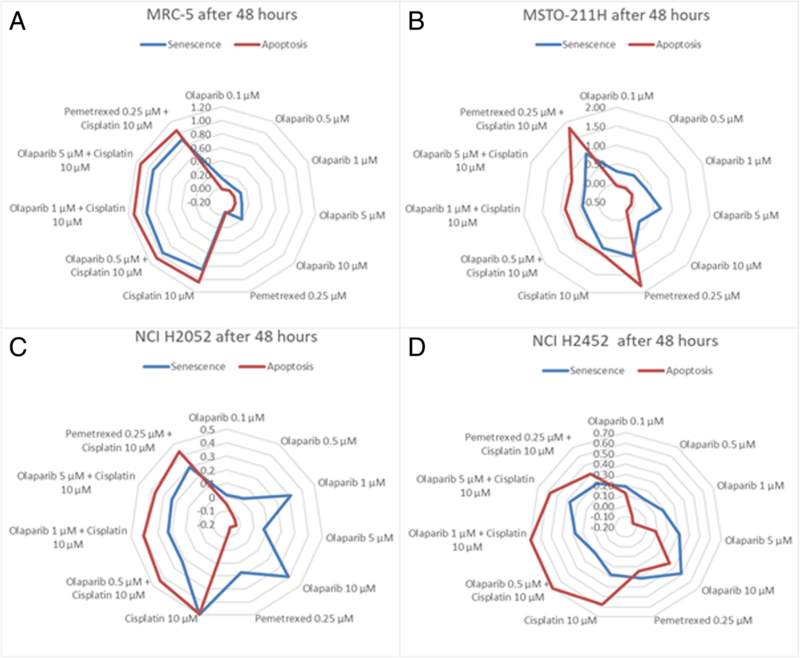 The control lung fibroblast cell line (MRC-5) and MPM cell lines: MSTO-211H, NCI-H2052 and BAP1-mutant NCI-H2452 were used for the cell culture experiments. Either single agent olaparib, cisplatin and pemetrexed, or cisplatin in combination with either olaparib or pemetrexed, was added to the cells. Response to treatment was assessed by using three luminescent-based assays detecting apoptosis, necrosis and senescence of cell lines. In addition, we aimed to find possible correlations between response and gene expression patterns associated with BRCAness phenotype. For determination of BRCAness phenotypes, RNA of the cell lines and 90 formalin-fixed, paraffin-embedded (FFPE) patient samples, was isolated and used for digital gene expression analysis of genes listed in Table 1. 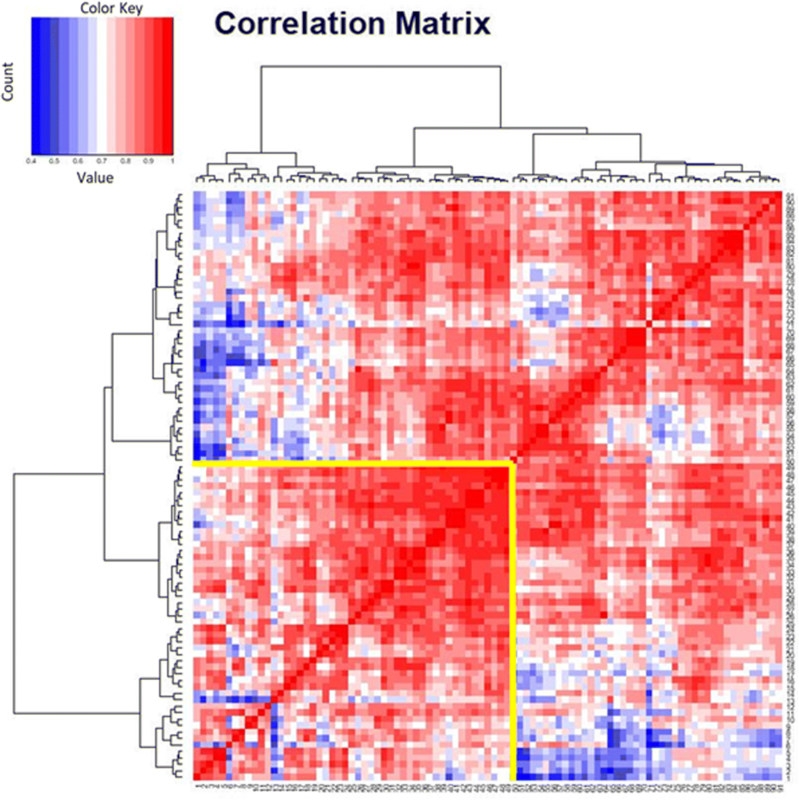 Correlation tests were used to determine response associated patterns in cell lines. These results were compared with the gene expression pattern of the patient cohort. We aimed to find associations between defects in HRR and response to cisplatin using survival prognosis with the help of the results of the digital gene expression analysis (Table 1). Tumour classification is based on the WHO classification of tumours guidelines (2015) . TNM-staging is based on the Union internationale contre le cancer (UICC) classification of malignant tumours . All samples were confirmed by two experienced pathologists (JW, TM). The study included MPM patients, treated at the West German Cancer Centre or the West German Lung Centre (Essen) between 2006 and 2009 and the Helios Hospital Emil von Behring (Berlin) between 2002 and 2009. Inclusion criteria were the availability of sufficient tumour material and the case to be listed in the clinical registry for tumour response and survival with a complete set of data concerning follow-up and treatment. Each patient underwent first-line chemotherapy regimen consisting of cisplatin and pemetrexed. The study was conducted retrospectively to identify gene expression-based biomarkers. It was approved by the institutional ethics review board (Ethics Committee of the Medical Faculty of the University Duisburg-Essen, identifier: 14–5775-BO). The investigations conform to the principles of the declaration of Helsinki. Response to chemotherapy was determined radiologically according to modRECIST . Response was classified as complete response (CR), partial response (PR), stable disease (SD) or progressive disease (PD). Remission was classified as CR or PR vs. SD or PD. Progression was classified as CR or PR or SD vs. PD. Progression-free survival was calculated from start of treatment until first radiological progression (modRECIST). Overall survival was determined from initial diagnosis until death or loss of follow up. Collection of all specimens was performed prior to systemic treatment. Surveillance for this study was stopped on August 31, 2014. General patient data are summarized in Table 2. MPM cell lines MSTO-211H (biphasic subtype, pemetrexed-sensitive) and NCI-H2052 (epithelioid subtype, cisplatin-sensitive) as well as the cell line NCI-H2452 (BAP1-mutant, sarcomatoid subtype) were cultured in Roswell Park Memorial Institute (RPMI) -1640 medium (Thermo Fisher Scientific, Massachusetts), USA. The human lung-fibroblast cell line MRC-5 was used as control cell line. MRC-5 cells were cultured in Minimal Essential medium (Thermo Fisher Scientific). All culture media were supplemented with 10% foetal calf serum and 1% penicillin and streptomycin (Thermo Fisher Scientific). For the treatment of cells, 5000 cells/well were used. The concentrations of the agents were 0.25 μM for pemetrexed (Selleckchem, Houston, USA) and 10 μM for cisplatin (Selleckchem). To evaluate the most efficient concentration for olaparib (Selleckchem), a dilution series comprising 0.1, 0.5, 1, 5, and 10 μM was applied. In addition to single-agent-treatment, cisplatin was combined with pemetrexed as well as 0.5 μM, 1 μM and 5 μM of olaparib to identify synergistic effects. 5000 cells per reaction were applied to detect apoptosis, senescence and necrosis. All reactions were measured using a luminometer (Glo Max Multi + Detection System; Promega). Senescence was analyzed using the CellTiter-Glo® Luminescent Cell Viability Assay kit (Promega, Wisconsin, USA). 10 μl of Digitonin (30 μg/ml), added to the cells in a separate well 15 min before cell lysis, served as positive control to measure a decrease of cellular viability of 100%. Necrosis was analysed using the CytoTox-Glo® Assay kit (Promega). Ionomycin (Selleckchem) was used for positive control. Two hours before measurement, 50 μl of Ionomycin (100 μM), was added to the cells in a separate well. After adding 50 μl of the AAF-Glo® reagent to each well, cells were incubated for 15 min at room temperature, protected from light. The apoptotic potential of the cells was analysed using the Caspase-Glo® 3/7 Assay (G8093, Promega). 100 μl of required cells/well were placed into a white 96-well plate. Staurosporine (10 μM, Selleckchem) served as positive control and was given to the cells in a separate well 4 h before measurement. After adding 100 μl of Caspase-Glo® reagent to each well, cells were incubated for 30 min at room temperature. Changes in cell state were calculated as percentage of signal gained by the positive control normalized to the baseline (untreated cells). RNA-isolation of 1 × 106 cells per sample was performed by using the Maxwell purification platform with appertaining reagents (Maxwell RSC simplyRNA Cells Kit, Promega). RNA-purification of FFPE specimens was performed by using the Maxwell RSC RNA FFPE Kit (Promega). The concentration of RNA was determined via fluorometric quantification (Qubit, Thermo Scientific) using the RNA Broad range assay kit according to the manufacturer’s instructions. 1 μl of each isolated RNA sample was applied for measurement. The multiplexed digital gene expression assay (PlexSet, NanoString, Seattle, USA) was used for the investigation of BRCAness phenotype gene expression patterns. PlexSet assay was performed according to the manufacturer’s instructions. 150 ng FFPE derived RNA from patients suffering from MPM and 70 ng of RNA freshly isolated from cell lines MRC-5, MSTO-211H, NCI-H2052 and NCI-H2452 were applied. Hybridization reaction was executed for 18 h. nCounter Prep-Station processing was performed using the high-sensitivity protocol. Cartridges were scanned on the Digital Analyzer (NanoString) with maximal sensitivity (555 fields of view (FOV)). Investigated genes in samples with counts < 100 are considered as not expressed. For statistical and graphical analyses, the R statistical programming environment (v3.2.3) was used. Nanostring data processing has been performed as described previously [19, 20]. In detail, Nanostring counts for each gene underwent technical normalization, based on positive controls included in a code set. Subsequently, biological normalization has been performed by calculating a normalization factor for each sample out of the geometric mean of the included mRNA reference genes. Additionally, all counts with p > 0.05 after one-sided t-test versus negative controls plus 2x standard deviations were interpreted as not expressed to overcome basal noise. Statistical analysis has been performed as described elsewhere . For exploratory data analysis of dichotomous variables either the Wilcoxon Mann-Whitney rank sum test (non-parametric) or two-sided students t-test (parametric) was applied. For ordinal variables with more than two groups, either the Kruskal-Wallis test (non-parametric) or analysis of variance (ANOVA) (parametric) was used to detect group differences. Double dichotomous contingency tables were analysed using Fisher’s Exact test. For more than two groups, the dependency of ranked parameters was calculated by using the Pearson’s Chi-squared test. Correlations between metric variables were tested by using the Spearman’s rank correlation test as well as the Pearson’s product moment correlation coefficient for linear modelling. To further specify the different candidate pattern, each unsupervised and supervised clustering to overcome commonalities as well as principal component analysis to overcome differences were performed. For the assessment of associations between gene expression and progression-free survival (PFS) or overall survival (OS), Kaplan-Meier analysis was performed. Significant differences in PFS or OS between tested groups were determined by using the COXPH-model. Therefore, the Wald-test, likelihood-ratio test and the Score (log rank) test were used. P-values were adjusted by using the false discovery rate (FDR) with a subsequently defined level of statistical significance of p ≤ 0.05. The human lung-fibroblast cell line MRC-5, BAP1wt/wt MPM cell lines MSTO-211H and NCI-H2052, as well as the BAP1 mutant MPM cell line NCI-H2452 were analysed for apoptosis, senescence and necrosis during treatment with pemetrexed, cisplatin and olaparib. While cell lines MRC-5 and MSTO-211H showed a strong induction of apoptosis and senescence by treatment with cisplatin or pemetrexed, olaparib did not have any apoptotic effect on these cells. NCI-H2052 and NCI-H2452 cells showed a notably lower induction of apoptosis than MRC-5 or MSTO-211H cells. The treatment of NCI-H2052 cells with 1 μM and 10 μM single-agent olaparib showed 30–50% induction of senescence. In BAP1-mutant NCI-H2452, 0.5 μM and 1 μM olaparib combined with 10 μM cisplatin induced the highest apoptotic effect with low induction of senescence (Fig. 2). No induction of necrosis could be observed with neither of the used agents, except for the MSTO-211H cells (data not shown). Especially, wells treated with pemetrexed as single agent or in combination showed a necrotic effect. Differences in gene expression patterns of each cell line with respect to response during olaparib-treatment were observed. The only cell line showing response to olaparib was the BAP1-mutant NCI-H2452. 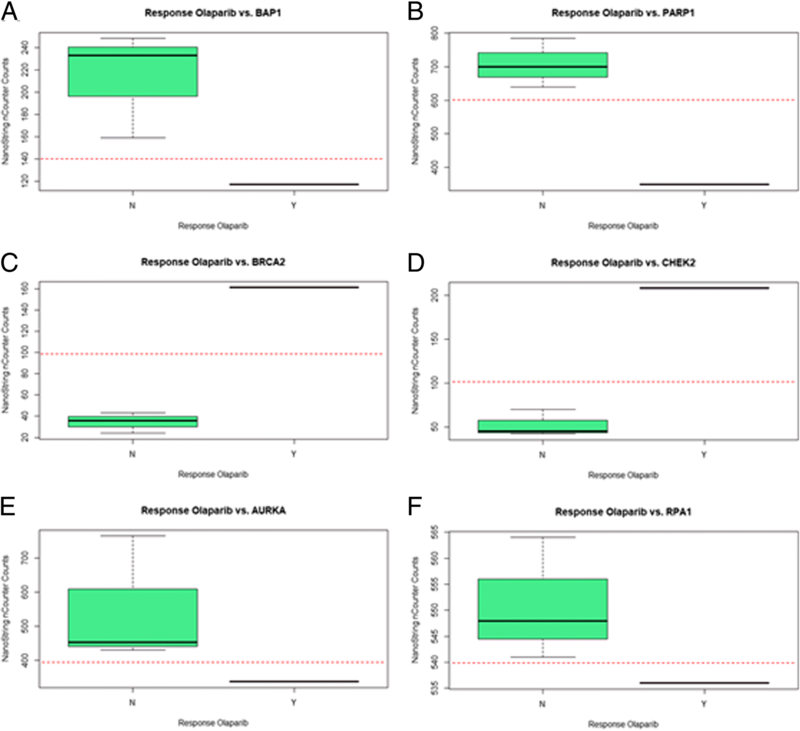 AURKA, replication protein A1 (RPA1), BAP1 and PARP1 were significantly lower or not expressed in NCI-H2452, compared to other cell lines (Fig. 3 a, b, e and f). BRCA2 and checkpoint kinase2 (CHEK2) were expressed in NCI-H2452, while other cell lines showed no expression with counts < 100 (Fig. 3 c and d). The expression pattern of these genes in BAP1-mutant NCI-H2452 cells could be found in approximately 10% of patient samples (Additional file 1: Table S1). Overall correlation pattern between different MPM samples is based on Pearson product moment correlation. Unsupervised clustering revealed two distinct groups, each comprising about half of all patients (Fig. 4). One group includes all samples with altered HRR (yellow box), including olaparib-responsive NCI-H2052 as well as BAP1-mutated NCI-H2452 cells. Of note, these 49 samples showed similar gene expression pattern of key enzymes involved in formation of BRCAness-like cell state, overall indicating two different phenotypes of MPM with respect to HRR based repair. The histomorphology of patient tumours revealed no significant differences in gene expression patterns (Additional file 2: Figure S1). By determining associations between gene expression and therapy response due to survival, AURKA, RAD50 and damage specific DNA-damage-binding-protein-2 (DDB2) were significantly associated to overall survival with FDR-adjusted p-values ≤0.02 (Additional file 3: Table S2). 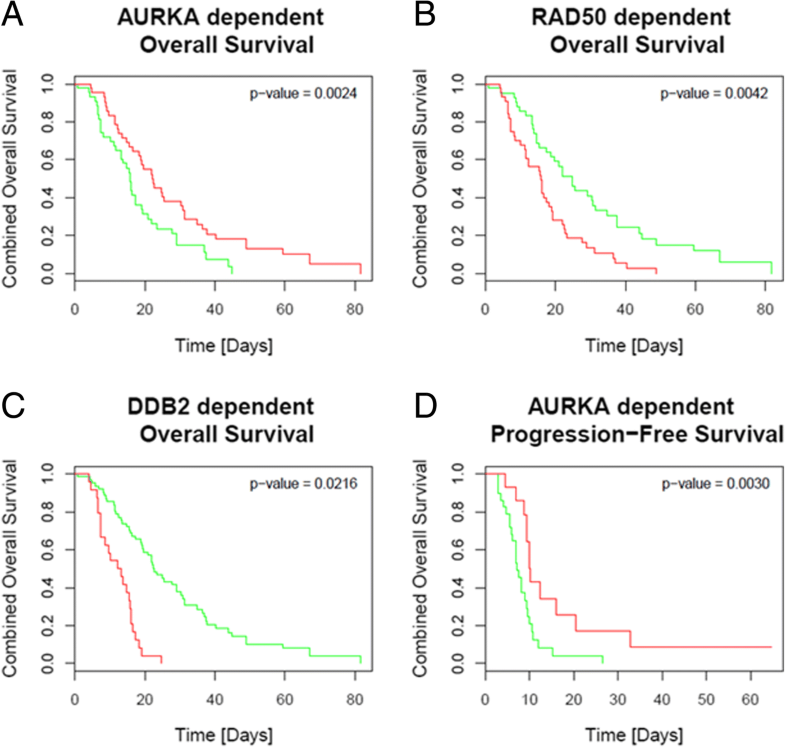 Patients with low expression of AURKA have a 2.4-fold higher chance of prolonged overall survival, while high expression of RAD50 and resulted in 2.3-fold higher risk of dying from their disease. High expression of DDB2 in patients showed a 4.373-fold chance of prolonged survival. In addition, low expression of AURKA showed also a 2.3-fold higher chance of prolonged progression-free survival (Fig. 5). This study was designed to evaluate gene expression of BRCAness related genes in MPM and their impact on susceptibility to olaparib. Defects in individual genes that modulate HRR, compiled under the term “BRCAness”, has been found in various tumours . Studies revealed, that impaired HRR results in enhanced use of NHEJ for DSB repair [10, 22–24]. NHEJ repair is more error-prone compared to HRR, often leading to DNA mutations, especially by deletions [10, 25]. This genomic instability predisposes cancer susceptibility caused by BRCAness . In the MPM patients investigated, ten of the 24 tested genes necessary for intact HRR were not significantly expressed (Table 3). Additionally, to this lack of expression, a loss-of-function of three of those genes could already be determined by Betti et al., who also found deleterious mutations in BRCA1, BRCA2 and PALB2 gene loci . The authors described BRCA1 and PALB2 exhibiting a deletion, leading to a nonsense mutational effect, while BRCA2 showed a frameshift due to deletion . The loss-of-expression of RAD51 is not surprising, as it is commonly deleted in malignant mesothelioma due to frequent losses from 15q11.1–22 . Nevertheless, as central element of HR by mediating the invasion into the homologous double helix of the sister chromatid and thereby directly regulated binding partner of BRCA2, RAD51 plays an important role for the shaping of BRCAness. Beside these main key-players of BRCAness phenotype development, genes of the Fanconi Anaemia (FA) pathway play an important role within this context of DSB repair. Of note, Fanconi anaemia complementation group D2 (FANCD2) as a key member within the FA, shows only basal gene expression levels in all analysed patient samples, indicating an impaired function of the FA pathway. It directly interacts with BRCA1 and BRCA2 but also ataxia telangiectasia mutated (ATM), thereby promoting DNA repair by HR [26, 29, 30]. In contrast, Røe et al. found an overexpression of FANCD2 in microarray data of malignant pleural mesothelioma patients , but the analysed sample size of five mesothelioma tissues is quite small. Therefore, these contradictory findings should be examined more detailed. The correlation matrix of gene expression patterns indicates a cluster of patient samples showing features similar to the olaparib-sensitive NCI-H2452 as well as NCI-H2052 cell lines. It could be assumed, that these patients could benefit from treatment with PARP-inhibitors. Assuming a favourable chance of response. In association with clinicopathological data, high expression of AURKA was associated with shortened overall survival and poor prognosis. The high AURKA expression pattern possibly explains the high mitotic and proliferative activity, rather found in more aggressive tumours with higher risk of metastatic spread. In contrast, high expression of DDB2 and RAD50 is significantly associated with prolonged survival. DDB2 is involved in DNA damage repair and is modulated by BRCA1 and/or p53 . It might be suggested, that DDB2 together with CHEK1, activates p53 and thereby triggers TP53-induced apoptosis and senescence in response to DNA damage . Barakat et al. showed, that overexpression of DDB2 enhances cisplatin-sensitivity in ovarian cancer cells . The present data indicate that these observations in ovarian cancer cells could also enhance cisplatin-sensitivity in MPM, resulting in 4.373-fold higher chance of prolonged overall survival. Zhang et al. demonstrated likewise, that loss of RAD50 is a key marker of BRCAness in ovarian cancers (OvCa) . Cell culture analysis demonstrated, that loss of RAD50 augmented OvCa cell’s response to cisplatin and PARP-inhibitors . Olaparib induces superior apoptotic response in BAP1-mutant tumours in vitro. It is shown that BAP1 is commonly mutated in MPM and thereby might cause defects in HRR as well as a BRCAness phenotype of affected cells [1, 35–37]. We hypothesized, that the PARP-inhibitor olaparib could have a therapeutic effect on BAP1-mutant MPM and, furthermore, that a combination with cisplatin enhances the inhibitory effect of the former one. A distinct expression pattern of investigated genes could be found in NCI-H2452 cells. In this cell line, induction of apoptosis could be proven during olaparib-based treatment. Furthermore, we could confirm enhanced therapeutic effects using olaparib in combination with cisplatin. Response of treated NCI-H2452 cells to olaparib has also been shown by Srinivasan et al. .
Necrosis was not detected in treated cells, which is preferable, because necrosis leads, compared to apoptosis, to adverse complications in therapy. The benign human fibroblast cell line MRC-5 was used as benign control. They derive from the same cotyledon (mesoderm), like malignant pleural mesothelioma cells. Therefore, it was preferred, as the e.g. control cell line MET-5a was SV40-immortalized and therefore shows altered culture performance . The TERT1-immortalized cell line LP-9 would be another option for using as control cell line . However, the use of this cell line as control has to be investigated and validated. Gene expression pattern of NCI-H2452 showed weak correlations to other cell lines, suggesting that gene expression pattern of BAP1 is associated with enhanced response to PARP-inhibitor olaparib. Furthermore, AURKA, RPA1, PARP1, BRCA2 and CHEK2 showed significantly different gene expression pattern compared to other cell lines. Transferred to patient samples, approximately 10% of patients have the same gene expression pattern as NCI-H2452 cells, making them suspicious for susceptibility to olaparib based treatment approaches. The BAP1 mutational status in combination with certain gene expression patterns seem to contribute significantly to cellular response to olaparib. Therefore, this may be a promising therapeutic approach for a substantial portion of MPM patients, especially when combined with platin-based agents. In conclusion, response could be demonstrated during treatment of BAP1-mutant NCI-H2452 cells with olaparib in combination with cisplatin. Thus, this combined therapy might be effective for up to 2/3 of patients suffering from MPM. Investigation of BRCAness related genes in MPM patients showed similarities in gene expression patterns compared to MPM cell lines (BACH1, FANCD2 and RAD51), particularly BAP1-mutant NCI-H2452 (BAP1, PARP1, BRCA2, CHEK2, AURKA and RPA1). These gene expression patterns represent a novel and promising tool for the prediction of response to the PARP-inhibitor olaparib. The study was financed by the Department of Pathology, University Hospital Essen. No additional funding support was used. Sample acquisition and histomorphology assessment were performed by JW and TM. Study design was outlined by KS, FM and TP. Experiments were performed by SB. Data analysis was mainly performed by FM, MW, TH1 and SB. Covariate acquisition was performed by WE, EM, CA, JK and JS. Clinical aspects of data analysis and interpretation were highlighted by WE, CA, JK, DC and TP. Pathological aspects of study was done by TH1, TM, JW and KS. For biological and cell-biological data interpretation, main contributions were made by SB, MW, JS, EM, TH2, RW and FM. In general, data interpretation as well as raising important points or drawing conclusions for discussion of the results was performed by all authors (SB, MW, JS, EM, JK, TH1, TM, TH2, DC, RW, WE, TP, JW, CA, KS and FM). Manuscript preparation was mainly performed by FM, KS and SB. All authors (SB, MW, JS, EM, JK, TH1, TM, TH2, DC, RW, WE, TP, JW, CA, KS and FM) reviewed and revised the manuscript critically. FM and RW and DC coordinated the project. Ethics committees’ approval was obtained by CA, JW, JK and TM. All authors read and approved the final manuscript. The study conforms to the principles outlined in the declaration of Helsinki and was approved by the institutional review board (Ethics Committee of the Medical Faculty of the University Duisburg-Essen), protocol no. : 14–5775-BO. Due to the ethics approval, a patients’ informed consent has not been obtained. All authors have read and approved the manuscript and are aware of the submission. The authors declare no conflict of interest. Database GHG. www.genecards.org. Accessed 20 June 2018.